Clairemont (or Clairemont Mesa) is a community within the city of San Diego, California, United States. It has a population of about 81,600 residents and an area of roughly 13.3 square miles. Clairemont Mesa is bordered by interstate 805 on the east, interstate 5 to the west, State Route 52 to the north, and the community of Linda Vista to the south. 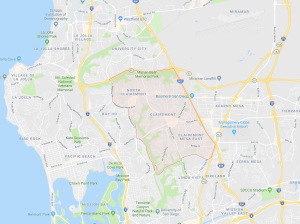 The community of Clairemont Mesa can be subdivided into the neighborhoods of North Clairemont, Bay Ho, Clairemont Mesa East, Clairemont Mesa West, and Bay Park. Clairemont’s main geographical characteristics include mesas, canyons, and streams. The predominant topographical features are the gently rolling mesas which are separated by canyons. These mesas are where most of the development is confined. Tecolote Canyon runs north-south through the center of this community. San Clemente Canyon runs east-west, bordering the community on the north side. A stream runs through Tecolote Canyon. Trails extend through the bottom of the canyons for hiking or mountain biking. The soil in Clairemont is primarily clay based. Tecolote Canyon Natural Park – Tecolote Canyon runs through the community of Clairemont Mesa and was dedicated by the City of San Diego as Tecolote Canyon Natural Park in 1977. This park is about 903 acres and is approximately six miles long. There are multiple entrances to park throughout the community; some of these entrances provide public parking and bathroom facilities. Marian Bear Memorial Park – Also known as San Clemente Canyon, it was officially renamed to Marian Bear Memorial Park by the City of San Diego in 1960. Marian Park is roughly 467 acres and runs parallel to the south side of the 52 freeway. The main entrances to the park are off of Regents Road and Genesee Avenue. Both of these entrances provide public parking, restrooms and picnic benches. Tecolote Golf Course – This 18-hole 3,161-yard golf course located within Tecolote Canyon. A natural creek-bed runs through the golf course, which was designed by Robert Trent Jones, Sr. and Sam Snead. Here at San Diego Properties we know the Clairemont market and understand the needs of clients interested in buying or selling in this community. Purchasing a property in Allied Gardens requires a partnership with educated & experienced realtors who will advocate the best for their clients. Contact San Diego Properties today at (619) 992-9121 for a free consultation.